Imagine this. In its latest report, the IPCC has predicted up to 3 meters of sea level rise by the end of this century. But “climate sceptics” websites were quick to reveal a few problems (or “tricks”, as they called it). First, although the temperature scenarios of IPCC project a maximum warming of 6.4 ºC (Table SPM3), the upper limit of sea level rise has been computed assuming a warming of 7.6 ºC. Second, the IPCC chose to compute sea level rise up to the year 2105 rather than 2100 – just to add that extra bit of alarmism. Worse, the IPCC report shows that over the past 40 years, sea level has in fact risen 50% less than predicted by its models – yet these same models are used uncorrected to predict the future! And finally, the future projections assume a massive ice sheet decay which is rather at odds with past ice sheet behaviour. Now, the blogosphere and their great media amplifiers are up in arms. Heads must roll! Unthinkable? Indeed. I am convinced that IPCC would never have done this. But here is what actually did happen. I mention this because there is a lesson in it. IPCC would never have published an implausibly high 3 meter upper limit like this, but it did not hesitate with the implausibly low 59 cm. That is because within the IPCC culture, being “alarmist” is bad and being “conservative” (i.e. underestimating the potential severity of things) is good. Note that this culture is the opposite of “erring on the safe side” (assuming it is better to have overestimated the problem and made the transition to a low-carbon society a little earlier than needed, rather than to have underestimated it and sunk coastal cities and entire island nations). Just to avoid any misunderstandings here: I am squarely against exaggerating climate change to “err on the safe side”. I am deeply convinced that scientists must avoid erring on any side, they must always give the most balanced assessment they are capable of (and that is why I have often spoken up against “alarmist” exaggeration of climate science, see e.g. here and here). Why do I find this IPCC problem far worse than the Himalaya error? Because it is not a slip-up by a Working Group 2 author who failed to properly follow procedures and cited an unreliable source. Rather, this is the result of intensive deliberations by Working Group 1 climate experts. Unlike the Himalaya mistake, this is one of the central predictions of IPCC, prominently discussed in the Summary for Policy Makers. What went wrong in this case needs to be carefully looked at when considering future improvements to the IPCC process. And let’s see whether we learn another lesson here, this time about society and the media. Will this evidence for an underestimation of the climate problem by IPCC, presented by an IPCC lead author who studies sea level, be just as widely reported and discussed as, say, faulty claims by a blogger about “Amazongate”? p.s. Recent sea level results. A number of broadly based assessments have appeared since the last IPCC report, which all conclude that global sea level rise by the year 2100 could exceed one meter: The assessment of the Dutch Delta Commission, the Synthesis Report of the Copenhagen Climate Congress, the Copenhagen Diagnosis report as well as the SCAR report on Antarctic Climate Change. This is also the conclusion of a number of recent peer-reviewed papers: Rahmstorf 2007, Horton et al. 2008, Pfeffer et al. 2008, Grinsted et al. 2009, Vermeer and Rahmstorf 2009, Jevrejeva et al. 2010 (in press with GRL). The notable exception – Siddall et al. 2009 – was withdrawn by its authors after we revealed numerical errors on Realclimate. This is a good example of self-correction in science (in stark contrast with the climate sceptics’ practice of endlessly perpetuating false information). Rather bizarrely, Fox News managed to turn this into the headline “More Questions About Validity of Global Warming Theory“. ** About the numbers stated above. Regarding the actual IPCC AR4 numbers, adjust the IPCC upper estimate of 59 cm by adding 15 cm to make it apply to 6.4 ºC warming (not just 5.2 ºC) and 5 cm to make it go up to 2100 (not just 2095). That gives you 79 cm. Add 50% to adjust for the underestimation of past sea level rise and you get 119 cm. For the hypothetical case at the start of this post, just introduce similar errors in the other direction. Let’s add 31 cm by going up to 7.6 ºC and the year 2105 (in fact that is “conservative” but it gives a nice round number, 150 cm). Now assume you have a model compared to which actual sea level is rising 50% slower (rather 50% faster): now you’re at the 3 meters mentioned above. For details, see The IPCC sea level numbers. The weak point is not in the sea level estimates, it is in the scenario estimates. There is no estimate of “plausibility” in the SRES. It’s just “what if” scenarios. If 5°C is already unlikely, then 6.4 °C is still more. Now how do the scenarios compare with reality? coal and gas are still far from their peak, but peak oil is close. There are numerous signs that the oil production will never exceed 100 Mbl/d, and even 90 may not be reached. How many scenarios are compatible with this value? none. So IF oil production peaks below 100 Mbl/d, THEN all scenarios are wrong about oil. IF all scenarios are wrong, THEN methodology is flawed. IF methodology is flawed, THEN nothing can be trusted. The bias is obvious : all scenarios are based on the hypothesis of continuous economic growth during the XXI century, which is nothing but wishful thinking. None has been validated by anything except politically biased governmental agencies reports, whose predictions have been definitely disproved in the recent years.. So you can extrapolate unlikely values , they will only be still more unlikely. OT, but I need help from those of you with research grant experience. You can give me as much or as little detail as you think it necessary to dispel claim #1. Before I post Part II, I will send a draft copy to any person whose information is being used and you will have carte blanche to edit what I had planned to post. Nothing will appear in my post that you do not confirm. I appreciate all the help you can offer! Gilles: If you want probabilities assigned to your future scenarios, then I recommend to you the MIT Joint Program on the Science & Policy of Global Change studies: http://globalchange.mit.edu/pubs/abstract.php?publication_id=2003, for example. These contain within them best estimates (and uncertainty ranges) of available fossil fuel reserves, economic growth, cost and reserves of unconventional fuels, improvements in efficiency, and so forth. No study is perfect, and the MIT study certainly isn’t, but it is a good starting point for thinking about the future probabilistically, and I’d be curious as to why you might think that your opinions should hold more weight than those of the energy economists on the MIT team? BTW there is some inconsistency here : “Second, the IPCC chose to compute sea level rise up to the year 2095 rather than 2100 – just to cut off another 5 cm.” It means that the sea level rise in 2100 would be around 10 mm/yr, but that limits the global rise over 90 years below 10*90 = 900 mm, and more probably with a linear increase of the rate (constant acceleration) to (10+3)/2 * 90 = 540 mm. On the other hand, reaching 3 m in 2100 would require an acceleration a such that vt+at^2/2 = 3*90 + a*(90)^2/2 = 3000, giving a=0,67 mm/yr^2, meaning that the rate should increase by +6,7 mm/yr every decade ! where is it to see ??? I am willing to bet $1.89 that someone will come out and claim that you have predicted 3 meters of sea level rise by 2105. Regarding the IPCC and its methods, practices, and standards – is there any other institution or organization in another scientific discipline whose mission and scope is close to the IPCC that a comparison can be made? Everytime I see current measurements compared with the range of predictions from previous IPCC scenarios, the measurements are at or above the IPCC’s worst-case. The scandal is that estimation errors in this direction are not a scandal. Thanks, Stefan. This really demonstrates the point that the media response to questions about the IPCC reports is asymmetric. People have complained that the AR4 SLR figures were misleadingly low ever since AR4 first appeared, but somehow that got exactly zero traction in the media. “IPCC says that 21st century SLR could be 18-59 cm. But IPCC is on one extreme end of the spectrum, and all those skeptical scientists out there are on the other extreme, so reality is probably somewhere in between and sea levels will probably rise but by less than 18 cm”. Now, that’s a completely ridiculous line of reasoning, but that’s how things work over here, unfortunately. Giles, your assumption that there will be no carbon-based energy to replace oil consumption is an interesting one. And by “interesting” I mean “naive” or “possibly deceptive”. We won’t burn anything once the oil is gone? No coal? No tar sands? No oil shale? Who sez? After the oil embargo of Japan in the summer of 1941, some Japanese turned to burning coal to power civilian vehicles. People do like to not walk. Why do you persistently elide the distinction between peak oil, and peak emissions from all fossil fuel combustion? You have done it again here, without the ghost of an excuse since you note yourself that “coal and gas are far from their peak” in the same paragraph as you say “if fossil production is close to peak, there is no reason for acceleration”? Why do you ignore the fact that there are reasons for sea level rise to accelerate even if emissions are lower than the SRES scenarios, given the unexpectedly rapid changes in both sea ice (raising arctic albedo) and ice sheets (raising the rate of ice flow)? Why do you insist both that fossil fuel use can raise the entire world to the wealth of France, and that continuous economic growth during the 21st century is nothing but wishful thinking? Maybe this is a bit rude, and I’d be the first to admit that I don’t know a whole lot about the science, but comment #1 looks sorta nutty to me. That’s sort of the problem, I think. Amateurs like myself have a hard time distinguishing legitimate science and sciency-sounding words and things. I do happen to know a *tiny* bit about the SRES assumptions, and my understanding is that they have been pretty well scrutinized, and that the IPCC has addressed a variety of different criticisms (although it would be useful perhaps to hear some of those rebuttals re-hashed, if anyone has the time and the patience). The reason why it got through is that it was “wrong” in the way that the most vocal would never promote as being wrong. In fact, one poster recently demanded “Where in the IPCC reports are there any underestimating prediction” as “proof” that the IPCC is alarmist. They were given several examples. But this hasn’t stopped the IPCC being labelled “alarmist”. A skeptic would have, though. I guess Stefan is a skeptic. Monkcton et al, not so much. Gilles, there is a large discrepancy in carbon reserves and how teh could be extracted. There is not much conventional left, but there still a lot of tar sand which can be tracted if we are really desesperate. Same thing for shale gas. Coal is lest obvious but there is still pleanty of it. Final heating depends essentialy on the total CO2 emited. To avoid 2C we must cut of CO2 dramatically NOW, which we know that will not happen. Therefore, we are commited to more than that. Neverthless, latest model gave a range of 1 more than 2 meters based on the range of IPCC scenario and the sea level model. A key aspect here is the thermal inertia of the ocean that introduce some buffer baring a collapse of the iceshelves. Nonsense, Gilles. Please don’t divert attention from the thread. The energy arguments are made over and over in every thread if not throttled early on. And there are far better places to argue them. Stefan, you have correctly pointed out the one sided concerns of AGW sceptics (self-sescribed). And I certainly acknowledge your expertise with regard to sea level rise. However, I wonder if even your corrections are not a bit optimistic? For example you assume a constant 50% underestimate of sea level rise. I understand that this is just for purposes of illustration and is not anything like a projection. But are there not indications of a nonlinear acceleration in Greenland mass loss? And are there not similar indications for Antarctica, with the possible (likely?) destabilization of the grounding lines of the Pine Island and Thwaites Glaciers? I realize these threats may be somewhat tentative and not that well understood at this point, but if they have reasonable probablilities, then they should be taken into account in policy development. Steve315, no you understood it well enough. Is the fact that the models predict 50% less sea level rise correlated with the apparently incorrect expectation that Antarctica would gain mass? ie. is this number being added twice? Why do you persistently elide the distinction between peak oil, and peak emissions from all fossil fuel combustion? because I didn’t. I didn’t say that peak oil IS the peak of fossil emissions, neither that it proves that peak fossils will occur sooner than the scenarios expect. I said that it proves that the methodology followed to establish the scenarios was flawed, which is not the same. It proves that the scenarios do not encompass the whole range of possibilities. Now the question of what will be the real amount of fossils extracted in the future is not a matter of scientific proof (there isn’t any), but a matter of reasonable guess, and use of available information. IF peak oil happens now or within a few years, it brings information : it brings the information that unconventional resources of oil cannot be extracted at a pace high enough to counterbalance the depletion of conventional ones, and that the economy can not bear too high a price of fossil fuels. They may be here, but nobody (or too few people) can afford them. That is very simple indeed. And if it happens to be true for oil, I wonder why it wouldn’t be true for other fossils, including coal. Expensive and bad quality coal cannot ALSO not be extracted at the pace of easy and good quality one, no matter the amount we have. You have done it again here, without the ghost of an excuse since you note yourself that “coal and gas are far from their peak” in the same paragraph as you say “if fossil production is close to peak, there is no reason for acceleration”? Why do you ignore the fact that there are reasons for sea level rise to accelerate even if emissions are lower than the SRES scenarios, given the unexpectedly rapid changes in both sea ice (raising arctic albedo) and ice sheets (raising the rate of ice flow)? v0.t+A t^2/2 = 3 * 90 + A *90^2/2 = 3000 giving A = 0,67 mm/yr^2 , meaning that the rate should increase linearly by +6.7 mm.yr-1 /decade. And more rapidly if it waits some time. Aheemm… I should say that I have seldom seen anything varying more smoothly than the sea level rise throughout the XXth century. This damned thing seems VERY heavy to move , even the 70’s that are supposed to be the beginning of “real” anthropogenic warming don’t show any clear acceleration… and in any case very very far from + 6.7 mm/yr /decade ! because of the non availability of enough easy-to-extract fossil fuels. You know, Yvan, the world economy is currently in a desperate state, but it doesn’t rush onto tar sands and oil shales, quite the opposite. Depletion of conventional resources doesn’t mean that we will miss energy – it means that the economy will crash and that we won’t need it anymore, simply because people will become poorer and poorer – that’s happening just now, all consumptions including electricity are decreasing. We don’t miss energy, we miss CHEAP energy, and expensive energy won’t help us. “perhaps”..yes :). I’d like too. Seriously. If the temperature is 5-6C warmer in 2100 I think sea level rise will be completely irrelevant. The vast majority of people on the planet will long since have starved and most species will be endangered or extinct. 6 degrees is game over – new azolla event time. While the ice in the North Pole melts, the temperature around it barely increases, because the latent heat of fusion prevents the heat from increasing while the ice absorbs the energy necessary to melt the ice. During this process sea levels barely rise because the ice floating actually tends to decrease sea levels as it melts, partially balancing glaciers melting that tend increases sea levels. Once North Pole the ice is gone, temperatures are free to rise again. With ripple effects around the earth, melting glaciers faster, then Antarctic ice. 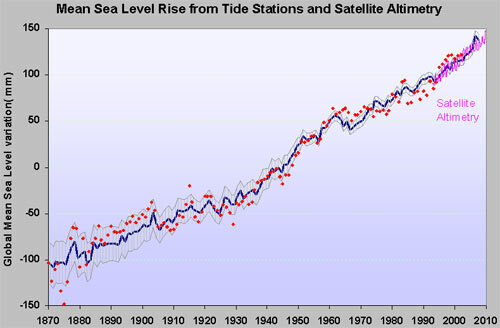 The later rising sea levels sharply. Antarctic ice will be much slower to melt because it will first need to rise in temperature from subzero temperatures before it starts melting. This will also trigger another plateau. Combined with other positive feedback effects such as the change in albedo mentioned above, and the release of increasing quantities of methane gas, this more than explains why there WILL be an accelerated temperature and sea level rise even if we stopped adding CO2 into the atmosphere. The later hypothesis being very unlikely because of the deceptive political climate of science deniers. All due respect to Stefan, but where does your “hypothetical” case come from? Is there a “denier” blog that actually indicated this or is it a complete fabrication? Unless the “hypothetical” case has some foundation in reality, this is nothing more than a classic strawman argument. Why include it at all? You have presented your critisim of the IPCC’s reluctance to be alarmist. Well done. What is the need to include some completely fabricated “denier” scenario, which says the opposite? Very interesting. The comment about not erring on either side, but giving the most balanced viewpoint possible is especially important in today’s incredibly polarized environment. The safe approach is to give ranges and probabilities within that range…but be sure you include the full range and the full time span! Let’s see…..Sea Levels have increased on average 1.7-1.8mm/yr over the last 150 years….Next 100…..let’s see…..heavy math here….. I predict 17.5cm sea level rise by 2110. From a policy view it would appear that the politicians expect the 2100 sea level rise to be the end of the matter. Yet all I see of scientific papers is that sea levels will continue to increase for centuries to come. So if we prepare for a, say, 3 meter rise then we may be a little early. But it will get there. Perhaps we should be expressing the error as time. That we expect a x meter rise by 2100 plus or minus y years. Emphasise that we know it will go up way over 5 meters but we are not sure how fast. Also in what order and at what rate do scientists expect things to happen. That way if it does happen faster than expected, we can be early warned. A Pine Island Glacier collapse would have implications on the stability of other glacier systems. You may be telling us that there is a degree of uncertainty on the upper limit of the rate of sea level rise, but we are not listening. You can hear the “no one told us” cries coming. a) Most of the carbon dioxide we emit goes into the oceans. b) A large part of the added heat retained by an increase in greenhouse gases also ends up in the oceans. Both of these processes would seem to have a limit– that is, the more carbon dioxide is in the oceans already, the less good the oceans are at absorbing increased CO2. Does anyone know to what degree these factors are incorporated into existing models forecasting temperature and sea level? Thanks! Gavin understandably doesn’t want to be taken OT by having it pointed out yet another dozen times that there is easily enough carbon left underground to cause terrible trouble. On the bright side, coastal cities that have been mostly depopulated by global famine will be easier to evacuate. And of course from the point of view of the people who are ultimately behind the campaign of deceit, denial, delay and obstruction, it matters little if the vast majority of human beings starve, as long as there remain sufficient resources to support “the top one percent”. I would like to see more articles here focusing on what the science can tell us about the likelihood, timing, and geographic distribution of AGW-driven, widespread, intense and prolonged drought. Today, Australia — tomorrow, the world? The larger error is the belief that Stern, the IPC WG3, etc. have not considered the economics and scarcity of various fuels (fossil, nuclear, agricultural, etc.). That’s usually the larger flaw with these critiques. It’s clear to me, at least, Giles, that you have not read either the Stern report or any of the IPCC reports, or if you did so, you had to have been skimming through them looking for something to disagree with. Also, your comment looks like a printed rendition of an extended talk radio monologue. Most of your IFs are false, and where they aren’t, your IF THEN is invalid. Moreover, you repeat the word bias without giving any evidence of understanding what it means in a science context. Moreover, you confuse models, scenarios and methodology, and use the word flawed in a meaningless way. It’d be easy to respond to that with “everything’s flawed, to a degree” since you’re so unspecific about the flaws (and don’t give estimates of their magnitude). Also, in your terms, why you’re wrong is that the IPCC estimates so far have been undershooting actual sea level rise – that’s not a “model” or something you can call flawed or biased, that’s a comparison of observations to stated projections. Your estimate of about a foot is approximately the IPCC estimate, although you’re knocking it down a mm a year for no rational reason (Peak Oil, even for those convinced we’ve already reached a world Hubbard Peak, doesn’t mean oil production slows immediately or even stops increasing, initially it’s more a pricing matter, and we’d have to freeze ALL GHG emissions at current rates to justify your claim). The problem is, so far, the IPCC estimates are conservative. Put another way, again in your terms, all that has to happen even if oil declined is just a little extra coal production from India and China, say, let alone lots of other countries, and your confident assertion becomes wrong, and hence, biased and flawed, and you cannot be trusted. Thank you for the post. I agree with everything you said. IMHO, the fact that the IPCC has been extremely conservative on some fronts (Arctic sea ice) and sea level, is quite a big story. So much for alarmism. What the IPCC should strive for is that all the metrics for the biosphere are internally consistent. That is no easy task in such a complex system. But their job, and that of the scientists, is not to shelter us from inconvenient or distressing news. It is well documented that there has been immense pressure at times to play down the seriousness of consequences associated with a much warmer planet, and this is how such inconsistencies can arise. Alas, the media and those in denial refuse to report and recognize this fact. Unfortunately, one is damned if you do and damned if you don’t with the deniers. Just present the facts which the body of science suggests is the most likely. Thanks for all your hard work on the matter of sea level rise. I, for one, am very grateful to know that there are eminent scientists like you working on this problem, and trust that you will do your utmost to arrive at the most plausible answer. You seem to be saying that the prediction of sea level rise to this point was made 40 years ago. I found this very informative. But I couldn’t help thinking that pretty soon we’ll find the fist few paragraphs of your piece cut and pasted and send around by denialists as an example of IPCC’s alarmism! There’s 6 billion people intensely interested in continuous economic growth. More on the way. I think we can count on relatively undiminished resource exploitation and continuing deforestation. Barring a complete collapse of civilization, world-wide, I think “CO2 levels will increase” is about the surest bet you can make. OK but don’t forget that in order to reach 5-6 °C, we need a fossil fuel consumption continuously increasing up more to three times the current one, a energy per capita more than 5 times the current one, and an economic growth insuring an average GDP/capita about the current US one. So you’re really talking about a strange situation where all this energy would be burnt by people having starved for death for a long time …. eeeuh .. as a physics teacher… yes indeed ! yes, the temperature of water mixed with ice barely increase, I agree… actually it remains almost constant neglecting the variation of salinity. Actually the melting of ice floating doesn’t decrease or increase anything if you neglect the variation of volume during the mixing of salt and fresh water… but since fresh water is somewhat less dense I would say it increases a little bit. really? and the other ice doesn’t need that ? I’m not a science denier : that’s my job…. I’m not a movie maker. It really is time to start looking into Doctor Strangelove-type end games. Is it just me or has the denialosphere blowhorn been turned up about 50 decibals as of late? Their most recent estimate is a rate of increase of 3.2 ± 0.4 mm per year. The data plotted (1992-2009) do not suggest an increasing rate in recent years. The trend value appears at best to remain the same. Of course one can not draw any conclusion about flattening based on only a few years, all that I am saying is that the curve certainly does not suggest an increasing rate. By extrapolation a value of 3.2 mm/year would imply a total global sea level rise of about 32 cm for the next century (till 2110). So how can you claim that a predicted value of 59 cm for the year 2095 would be implausibly low? That’s strange regarding the fact that sea level was ALREADY rising for a century or so, at 2mm.yr^-1, even without net warming : what the hell did they put in their calculations ? Great post. Thanks very much for this. Tks Stefan R.- and Gavin S. et al. ça va sans dire – for your 2007 post as well. Some journalists did care, asked local scientists to check your figures (nothing personal, just standard practice), and tried to explain why research was pointing to higher sea-levels. WHO assessments of epidemiological models for AIDS-TB-malaria perhaps? “Current measurements”: quite so. The main exception was CH4 concentrations staying flat. It made for good copy while it lasted. There seems to be a repeat of the errors of Malthus and Ehrlich running through this thread. What I see is the begining of an S-shaped curve in sea level. I don’t know what the eventual sea highstand will be, except that the maximum possible is around 80 meters. As for the rate of the S-shaped curve, dunno. I find all this sea level talk by skeptics quite wearisome. I live in Florida and have spent decades walking along Florida’s coastline. The sea level has risen and the coastline has retreated in a perceptible manner and this process of rise & retreat is accelerating. 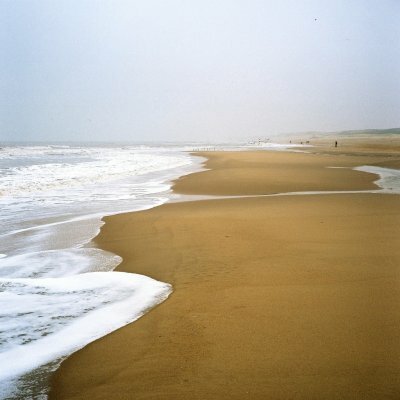 It is easy to perceive changes in the sea level, too, since ecological zones move inland. It is well known that Florida was completely covered by the ocean recently from a geological standpoint. Yet conservative newspapers and politicians continue to deny the threat of global warming. The great cause of Florida’s political class at the present moment is oil drilling. The remedy: Read the posts for science; read the comments for entertainment! > Their most recent estimate is a rate of increase of 3.2 ± 0.4 mm per year. wilt, you’re pointing to fairly old information, on a page that hasn’t been updated recently. Are you aware of how much new information has come out? Recent reviews … show that the most up to date estimates of mean rate of sea level rise for the 20th century are converging on around 1.7 to 1.8mm/year, with uncertainties of around 0.2 to 0.3mm. …. the “slowing down” reported by some observers (around 2008) has proved short lived (judging from 2009/2010 data)…. Again refinements and corrections of recent datasets from GRACE (with GPS) and ARGO resolve previous and relatively recent difficulties, so that the sum of these climate-related contributions (2.85 ± 0.35 mm per year) is now comparable with the altimetry-based sea level rise (3.3 ± 0.4 mm per year) over the 1993 to 2007 period …. while the steady and gradually accelerating increase since pre-industrial times of around 30cm or a foot may appear manageable, if the recent trend of accelerating mass loss from Greenland and Antarctic Ice caps, as well as the world’s glaciers continues, then the potential sea level rises will have significant impact …. The weight of peer-reviewed evidence for this acceleration in sea level rise is robust…. (from the same skepticalscience page) _looks_like_ sea level changing faster. I’d guess this kind of eyeballing evaluation is getting the kind of study that Tamino takes on, findint a statistic suitable for asking whether we can distinguish a linear trend from an acceleration in rate of change. Or for the current and committed warming to cause the release of just a portion of the methane currently locked in clathrate ices and the CO2 currently locked in permafrost tundra and bogs. Just ask yourself what the mean surface temp was the last time atmospheric CO2 was at 387 ppmv, oh, about 15 mya in the middle miocene.